Martin Luther was named after St Martin by his parents Hans and Margarette Luther, a pair of hardworking and pious Germans who were determined their son would suceed in life. Hans Luther's was a farmer's son but turned his back on the land and became a copper miner. In 1484 following the arrival of baby Martin the Luthers moved from Eisleben to Mansfeld to improve Hans' job prospects. Hans became a successful copper smelter and by 1491 the Luthers were one of the most respected families in Mansfeld. Martin's mother, Margarette came from a small but very well-off family. Despite her soft upbringing, she did her share of the family's workload but	with three children to look after she was a harsh disciplinarian. Luther recalled once, "(that) for the sake of stealing a nut, my mother once beat me until the blood flowed". Hans also ruled his son with an iron fist, Martin later recalled, "my father once whipped me so hard I ran away - I hated him until he finally managed to win me back". Hans had high hopes for his first son and had his heart set on Martin becoming a lawyer which would enable the Luthers to climb even higher up the social ladder. Young Martin followed his father's wishes without protest. He was sent to the best schools in the area and then university at Erfurt. In 1505 Hans was devestated to learn that his son, without consulting him, had decided to embrace religion and had sought admission to the house of the Augustinian Hermits in Erfurt. 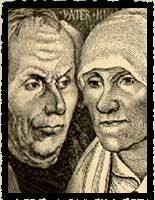 Both lived to see their son married in 1525 and the birth of several grandchildren before Hans died in 1530 and Margarette in 1531. The Luthers, who were disappointed that their son had not become a middle-class lawyer, both witnessed his transformation into one of the most famous and infamous figures of the medieval world.